The funny thing about this one was that it didn’t really have a solidly established plot until I started writing it. Well, and even then, it just sort of went where it wanted to. I certainly wasn’t planning on Brassica getting hobbit-napped. I think initially the thrust of the thing was going be about meeting the Elves in the Eavespires, which was the reason Beldrieth and Celebarad were heading to Evendim in the first place. But elves are a bit boring, and there’s that darn Ent up in the Eavespires, and I didn’t want to deal with him. I suppose where the last piece was really an introduction to Brassica (mainly concerning a hobbit, as it did), this one is probably more about Celebarad. He got to say things of his own, instead of shamelessly filching bits and pieces of Elvish from Arwen-Undomiel or translating things through Beldrieth! Thank goodness for the Rangers, and the fact that the Dunedain can be considered to speak Elvish, or he would have just continued to be a functionally silent character, with only the barest hints of personality. I worry a lot about whether or not he’s likable. From Brassica’s perspective I know he sounds like a bit of airhead, and truthfully, he probably is. Largely, it’s just that he’s easily distracted, and not used to paying attention. Another thing he has in common with Brassica is that he’s heard all the stories, but he never really expected to be living one. His dialogue is just mentally exhausting, though. The formality of it seems like it’s been built in, but I hope it doesn’t come off as incredibly pretentious. I love writing it, don’t get me wrong, but making it sound like Elvish is difficult. What comes through in Celebarad is my fondness for a nicely turned phrase. I’m incredibly self-indulgent on that front. There are a further 1.5 GIGABYTES worth of screens of him fighting Percy Alroyd, that were the result of Devonna’s excellent How to Take a Great Screenshot post. Most of them need to be deleted, because even with FRAPS set to capture every second, it’s still hard to get good shots. I did a gallery post with the best of them, though, and I can’t pretend I’m not pleased. Those stupid Rangers! The instance where you actually make the assault on Rantost takes place in daylight. And that sure did upset me, because it didn’t seem to be a sensible strategy, and didn’t sit right with the mental image I had of the actual fight. So there’s been some creative liberty taken there. To the best of my knowledge, this is the last experience Brassica’s going to have in a boat, despite her conviction that there have to be more of them out there, there’s no others to be found in Eriador. Unless perhaps in Forochel? I haven’t ever actually been through Forochel, except via the epic. Or, you know, I suppose if we ever get to Lothlorien and decide to cross the Anduin, then there’d be a wee bit of boating. That’s a loooooooong way off, though. I like Celebarad. I don’t think I could choose a favourite toon, but I’d definitely grant him being the best looking of the lot. Bel’s a bit too serious, Llythne’s got that crooked nose, and Brassica is a hobbit, and therefore subject to a different standard of beauty. The Guard was a lucky combo of features that resulted in him being quite handsome, imho, because I know it’s occasionally possible for elves to come out looking rather stupid. I did not have the same kind of luck with my RK, who looks…well, pretty chiseled. Actually, he looks like he’s the one who should be a guardian. Broad across the shoulders, cheekbones like mountain ranges, bit of a lantern jaw. Oh, and Bieber Hair. Speaking of the title image as I did, you may have noticed the disparity in the actual title of the piece vs. the title in the image. The change was mostly cosmetic, with regard to the acronym that resulted from the title. Here’s the thing about Percy. I needed a villain. I didn’t know I needed a villain, setting out, and I don’t think I even realized it as late as the last paragraph of Part 4, where I Chekov’s Gun‘d him as “some higher authority” to be revealed at a later time. I honestly didn’t know a thing about the way Percy would behave until I wrote his first line of dialogue. I’m glad he ended up at least a little more subtle than just another coarse tomb robber. I haven’t actually written a lot of villains, and I broke what I know to be an established rule about believable bad guys; a believable villain doesn’t really think they’re doing evil. The best villains are sympathetic, and with a shift of perspective, the same story about them would be just as compelling. But I didn’t need that out of Percy, and honestly, it’s substantially more depth than what’s required of somebody whose sole literary purpose was to be stabbed by a vengeful elf. I just needed somebody who would be satisfying to kill, so he’s got that cruelness to him, and that ruthless edge of slight insanity. All that said, it became necessary to take Percy in the other direction as much as could be reasonable. 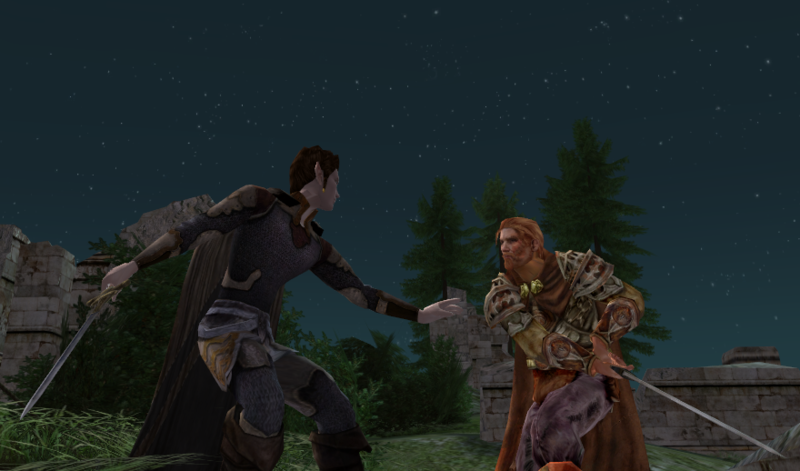 LotRO doesn’t humanize its bad guys, because by and large, its bad guys aren’t human. They are creatures of pure evil, with a handful of exceptions. Theoretically, the robbers of Rantost would be one of those exceptions. Actually, as the quest chain where you confront the family and friends of all the people you bounty-hunted demonstrates, the brigands probably are a rare exception. They’re just men. Not Orcs, not Angmarim Sorcerers, not Wights. I tried to demonstrate just a little bit of that, when Celebarad’s reflecting on the fact that he needs to go and kill actual people for the first time in his life, and afterward, when he needs to come to terms with having killed a guy, however noble his reasons for doing so. I’m getting a little weary of Evendim, to be honest. Love the zone, especially love it since the revamp. But, see, here’s the thing. I live with a roommate, and she has a toddler, who occasionally toddles in, and wants to watch (“you play your game?”). And he is very fond of Evendim (because “castles!”) And for some strange reason, he’s fonder still of watching me swim. So when he spots Annuminas (“go that way!”) in the distance, we’re off across the lake, and despite the very thoughtful inclusion of boat travel, it’s still Everswim for me. 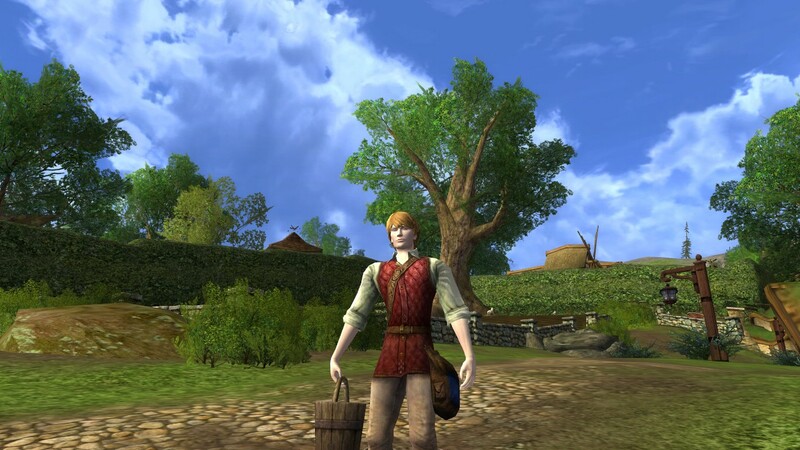 I’ll take this opportunity to link again to the outfit that was made for Brassica over at lotrofashion, and to mention that I plan to have another outfit post up soon about what the guard runs around Middle Earth in. In the meantime, Celebarad’s about page is also just about ready to be posted, and we’ll learn a little bit more about what makes him tick. And that’s been But A Day from Home! Thanks to everyone for reading, if anyone has any comments or critiques, I’d love to hear them. The next story will be titled “And the Echoes All Around”, and will hopefully teach us more about Llythne. Actually, it’ll hopefully teach me more about Llythne, because much like Percy, right now she’s a bit of a wild card. I really enjoy this behind the scenes look. I think Celebarad is very likable. And I would have been interested in reading more about your version of Percy. I’m thrilled the story continues.